Saturday May 8th 1909 I was busy with the work all forenoon as I had baking to do till went to town after dinner and I put in all the aftnoon taking things out of the larder and storing in the garret. They expect to begin on the home Monday & read in the evening. Sunday May 9th 1909 I got the work done in time to go to church Lady [more run Wellis?] strength the wire fence this morning but did real [hurt her any?]. I got the dinner out and wrote some, a letter to Lizzie The aftnoon was very short. I read in evening and went to bed early. Monday May 10th 1909 We got up early this morning as will had sold some hogs to be taken to town, The men came today to begin work on the house They got the small porch away from the front and moved in the back yard. I went to town in aftnoon. to have some work done on my teeth did not get to come home till 5.30. Did evening work. 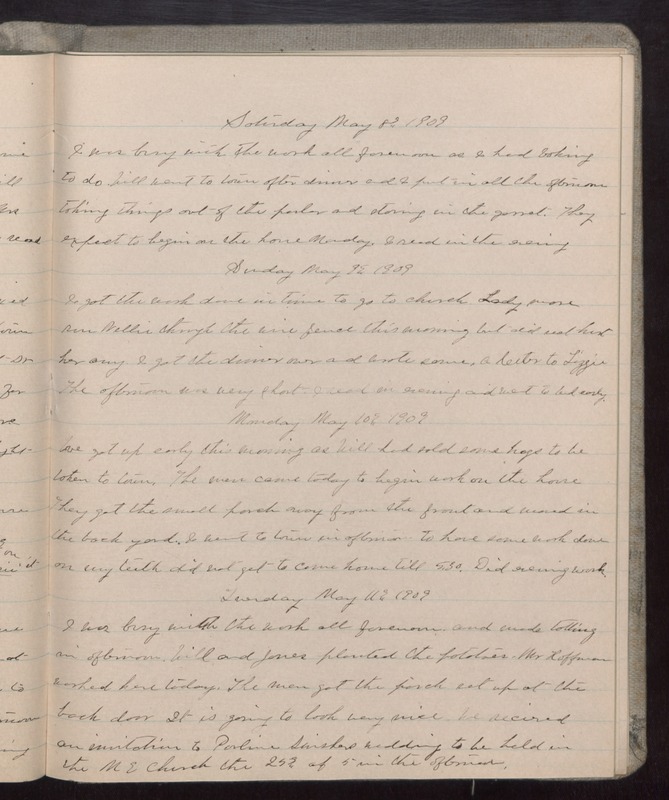 Tuesday May 11th 1909 I was busy with the work all forenoon.and made nothing in aftnoon. Will and Jones planted the potatoes. Mr Roffman worked here today. The men got the porch set up at the back door It is going to look very nice we recieved an invitation to Pauline [Swishers?] wedding to be held in the M E church the 25th at 5 in the aftnoon.